This community website was set up in 2016 to help keep you up to date with everything that is happening in the Kirkby Malzeard, Laverton and Dallowgill area, and three years on we have had over 47,000 visits to the site. It is a community venture by local residents, so if you want anything included just let us know! All inclusions, including information about businesses, are free. We hope you find this website interesting - new information is being added all the time, particularly to the Events Calendar which is updated regularly. * Approval has been granted for the residential development off Laverton Road on the western edge of Kirkby Malzeard - the link to the HBC Planning Department website is available on the News Page for further details. The Parish Council will obtain further clarification as soon as possible regarding the proposed alterations to the road system and all other Reserved Matters. * Residents have recently received a leaflet and sticker about Scams along with the first Tour de Yorkshire flyer - a Scam Awareness page has been added to the Parish Council website if you require further information. * Some interesting historic information about the Queens Head public house has been unearthed by Sheila Douglas - please see the Local History page. * We have also just added records of Baptisms, Marriages and Funerals in the Parish from 1653 to 1900 prepared by Sheila Douglas to the Local History page - see what your ancestors got up to! The number of people viewing this site is very encouraging, as is the feedback, but more contributions would be great, so if there is anything you want to publicise on here just send it in! You can e-mail information to kmagadmin@btinternet.com or phone 658838. GDPR: By providing your contact details within contributions you are consenting to them being made public on this website. If you do not wish them to be, please do not include them in the text. We would normally only show first names and telephone numbers/e-mail addresses in any case. If you have any questions or concerns please contact us. 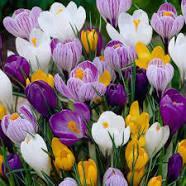 This year's Crocus Walk raised £271 for Breast Cancer Care and a further £58 towards School funds. Well done to everyone who organised the event and those who took part.